Worried about China’s strengthening navy and South China Sea claim, the former adversaries are setting ideology aside. The great Victorian era statesman and British Prime Minister Lord Palmerston once said: ‘Nations have no permanent friends or allies, they only have permanent interests.’ He would presumably have loved to live long enough to see the USS John McCain visit Danang port in Vietnam last month. This visit, along with one a few days earlier by the aircraft carrier the USS George Washington, marked the 15th anniversary of the establishment of Vietnam-US diplomatic relations, when two former Cold War foes started on the journey toward friendship. It’s an interesting irony that the United States is extending the hand of strategic co-operation to Vietnam as it remains mired in a modern-day version of Vietnam— the war in Afghanistan. But the increased interest in the region also suggests that the United States is beginning to look beyond Afghanistan as it prepares to withdraw after a decade-long conflict. The big question is what has prompted this intensification of interest now. But it’s a question with an easy answer—Beijing’s increasingly aggressive posture in South-east Asia generally, and in the mineral-rich South China Sea in particular. The apparent shift in US policy came to global attention in July, with US Secretary of State Hillary Clinton stating at the ASEAN Regional Forum that the United States saw the South China Sea as a global commons; she also suggested that China should peacefully settle sovereignty issues with contending nations. In effect, she was hinting that the US has its own national interests in the South China Sea. But this shouldn’t have come as too much of a surprise. 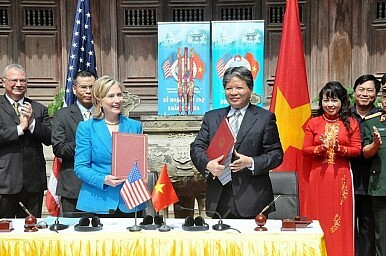 After all, Clinton had said a year earlier at the same forum that the US would return to South-east Asia. This was seen at the time as a confidence building gesture among US partners in the region. But there was also a clear strategic element to her follow-up remarks in Hanoi a year later—Vietnam has now been drawn into a huddle with the United States, not least because it occupies more of the contentious Spratly Islands than any other nation. Clinton’s move followed Chinese claims that the South China Sea, including the Spratly Islands, were now a ‘core interest,’ making it on par with Tibet and Taiwan, and thus making any outside interference taboo in Chinese eyes. In response, Clinton proposed that the US help establish an international mechanism to mediate the overlapping claims of sovereignty between China, Taiwan, the Philippines, Vietnam, Indonesia and Malaysia that now exist in the South China Sea.